The DH25H is a Double Hit ram type end former with top and side load accessibility. This high speed end forming machine is designed to increase flexibility during the fabrication process while decreasing production time. The DH25H was specifically designed to offer top or side loading so you can form the ends of the tube before or after the bending process has been completed. PLC controlled, the DH25HH can be programmed to make a single hit or a double hit end form. Capable of tube flaring, swaging and bead forming, this machine is ideal for equipment OEMs in the refrigeration, automotive, HVAC, furniture, and construction as well as other special applications. Quick change tooling is a paramount used to keep changeover time to a minimum. For example our 37 degree flaring tool set takes only 3 minutes to change out. Other similar tools would be for brake line flaring, bubble flaring, and tube end forming. 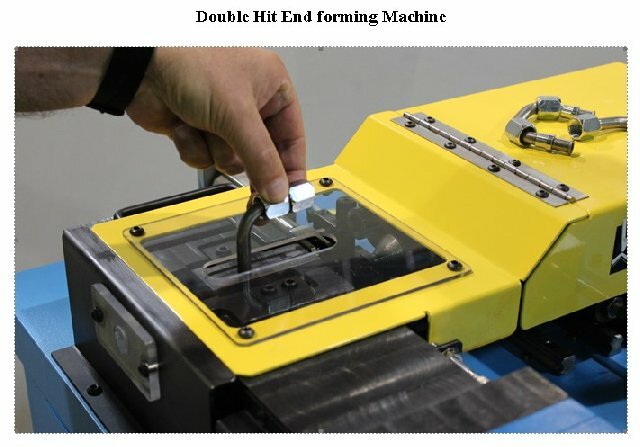 This machine offers manufacturing flexibility by enabling the operator to form the end of the tube before or after bending the tube. Check out the video and see this machine in action. Questions? Call us at 770-831-1917. Read the Tech Talk about this product. Need an engineered solution similar to this product? Contact us. Winton is committed to supplying its customers with high quality products that have a positive impact on your production process. We offer installation services and ongoing support on all our products as our promise to be sure that our machines continue to add value to your manufacturing processes. Winton's engineered solutions create new innovative machines as well as adaptions for existing ones. We will customize our standard products to meet your specific needs. Contact us today.